Welcome to Zukzi, Imitation Baroque mention chest and waist, layers of skirt, will be complicated in detail and fine craftsmanship reflected most vividly, and then tailoring and fashion fusion of modern pop elements, like the bow, folds, creating both ancient and modern different kind of style. -- Please provide your correct address and phone number to make sure pacakge will be delivered successfully. -- Best quality and price ever!!! For more dreamy and affordable dress, please click in our shop Zukzi above the Title. 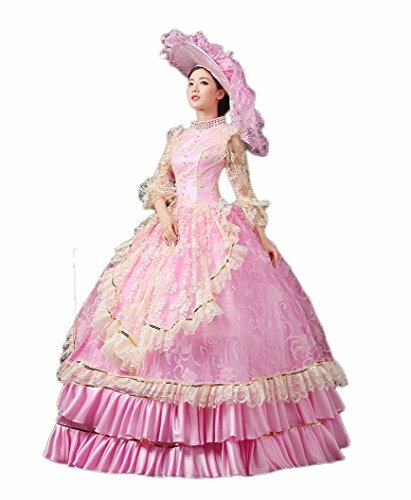 This is our design of Baroque Style, Date first available at Amazon.com can prove that we are the first seller, and guarantee the workmanship is excellent. 0: Bust: 31.4"; Waist: 24.7"; Hip: 32.6"
2: Bust: 33.0"; Waist: 25.9"; Hip: 33.8"
4: Bust: 34.2"; Waist: 27.5"; Hip: 35.4"
6: Bust: 35.3"; Waist: 28.6"; Hip: 36.5"
8: Bust: 36.5"; Waist: 29.8"; Hip: 37.7"
10: Bust: 37.7"; Waist: 31.0"; Hip: 39.3"
12: Bust: 39.3"; Waist: 32.6"; Hip: 40.5"
14: Bust: 40.5"; Waist: 33.8"; Hip: 41.7"
16: Bust: 41.6"; Waist: 35.3"; Hip: 43.3"
Bust: Wrap a measuring tape around your body at the fullest part of your bust. Waist: Wrap the tape around your body at the natural waistline. Hips: Wrap a measuring tape around your body at the fullest part of your bottom. If you have any questions about this product by Zukzi, contact us by completing and submitting the form below. If you are looking for a specif part number, please include it with your message.